GPU programming in MATLAB is intended for scientists, engineers, or students who develop or maintain applications in MATLAB and would like to accelerate their codes using GPU programming without losing the many benefits of MATLAB. 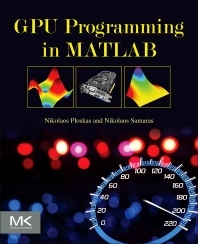 The book starts with coverage of the Parallel Computing Toolbox and other MATLAB toolboxes for GPU computing, which allow applications to be ported straightforwardly onto GPUs without extensive knowledge of GPU programming. The next part covers built-in, GPU-enabled features of MATLAB, including options to leverage GPUs across multicore or different computer systems. Finally, advanced material includes CUDA code in MATLAB and optimizing existing GPU applications. Throughout the book, examples and source codes illustrate every concept so that readers can immediately apply them to their own development. 1.4 Why GPU Programming in MATLAB? When to Use GPU Programming? Dr. Ploskas has participated in several international and national research projects. He is the author or co-author of writings in more than 40 publications, including high-impact journals and book chapters, and conference publications. He has also served as a reviewer for many scientific journals. He received an honorary award from HELORS (Hellenic Operations Research Society) for the best doctoral dissertation in operations research (2014). He has served on the editorial board of the Operations Research: An International Journal, and as a reviewer in many scientific journals. He has also held numerous positions within HELORS (Hellenic Operations Research Society). He was awarded with the Thomson ISI/ASIS&T Citation Analysis Research Grant (2005). Dr. Samaras has published more than 35 journal papers in high-impact journals, including Computational Optimization and Applications, Computers and Operations Research, European Journal of Operational Research, Annals of Operations Research, Journal of Artificial Intelligence Research, Discrete Optimization, Applied Mathematics and Computation, International Journal of Computer Mathematics, Electronics Letters, Computer Applications in Engineering Education, Journal of Computational Science, and Applied Thermal Engineering. He has also published more than 85 conference papers.